Greasy, flaky skin may be a sign of seborrheic dermatitis. This skin disorder causes cradle cap in babies, dandruff in adults, and unsightly rashes on other parts of the body. 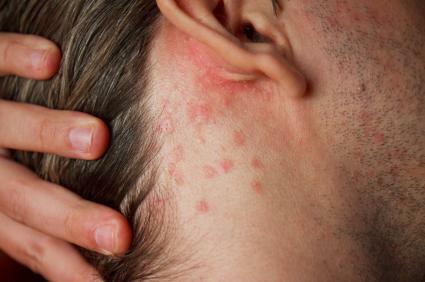 This type of dermatitis rash often appears on the scalp or other oily areas of the skin. The rash is scaly and greasy looking, and the skin underneath may be red and inflamed. It is often itchy and may be painful. Seborrheic dermatitis commonly gets worse in winter and early spring, and gets better during the summer. On the face and head, the rash may begin on the scalp, causing dandruff-like flakes. It may spread to the forehead, the eyebrows, the skin folds around the nose, the area behind the ears and, on a man, the beard line. It can also appear in these places independently. On the body, round or irregular patches of scaly skin may appear. Anyone can get this rash. It can occur in people of all races and backgrounds. The cause is not known. Doctors think there might be a connection with a certain fungus that lives on the body, but many people have this fungus and do not have problem skin. It's also possible that the disorder is linked to hormones. According to FamilyDoctor.org, the disorder is common among babies under three months old, as well as adults between the ages of 30 and 60. People with Parkinson's Disease and AIDS may also be higher risk. It should be noted, though, that anyone can be afflicted with the condition. Treatment usually consists of special shampoos and lotions. It's important to check with a doctor before starting any form of treatment, to make sure that the diagnosis is correct and that the treatment is appropriate. Other, more serious skin problems can look like seborrheic dermatitis. Occasionally this rash can signal the presence of a much more dangerous disease like HIV/AIDS. Many companies have started marketing dandruff shampoos that have benefits for the hair and the scalp. Pantene anti-dandruff shampoo and Aveeno Nourish + Dandruff Control anti-dandruff shampoo help strengthen the hair as well as treat the dandruff. Both of these products contain zinc as the active ingredient. Taking time to wash your hair and scalp thoroughly may also help. Rub the treatment shampoo into your hair gently but thoroughly and then let it sit for several minutes before rinsing. If thick, scaly plaques have formed on the scalp, treating overnight with a tar solution or bath oil may help. Scalp massages may also be effective, because they stimulate blood flow to the area. A five minute daily massage is optimal. If the rash affects the eyelids, gentle cleaning with baby shampoo and a cotton swab may help to loosen and remove flakes and plaques. Dandruff shampoos may be used on the face (but not around the eyes), but in some people they are irritating to facial skin. Antifungal creams and a lotion containing sodium sulfacetamide are other options which your doctor may suggest. Steroids may help, but should not be used long term because they can damage the skin. To keep the disorder under control, it's important to bathe regularly and use soap and water. Skipping your shower or bath will allow the plaque and flakes to worsen. Dandruff shampoo can be used to treat patches of seborrheic dermatitis on the body. Your doctor may also prescribe antifungal creams or benzoyl peroxide washes. Some doctors recommend steroid creams to help calm the inflammation. Again, steroids should be used only short term. When a baby develops a scaly, greasy-looking scalp rash, it's often cradle cap. The name reflects the fact that babies usually get this rash when they're less than three months old. Cradle cap doesn't reflect poor care on the part of the baby's parents, and it's not infectious. It generally goes away on its own. To treat the infant skin problem of cradle cap and make the baby's scalp look nicer, doctors usually recommend gentle cleaning with a mild baby shampoo. Using a soft brush, gently brush the shampoo over the scalp to loosen the flakes. Be careful not to break the skin: scrubbing too hard may be painful for the baby, and the skin could get infected. Check with your doctor before trying any treatment, and especially before using medicated products. Living with this type of dermatitis is challenging, but there's no reason why you can't live a healthy, happy life. Besides good care, you'll need to pay close attention to everyday products that may aggravate your skin. Change laundry soaps and body care products as often as you need to support your sensitive skin, and take advantage of the numerous treatment options available today. If you find that over-the-counter products aren't effective, seek medical attention for a stronger option.